At least it is for someone who loves variety. Woodworking is an inexhaustible source of learning. There is always another technique or talent you can acquire or challenging project you can build. 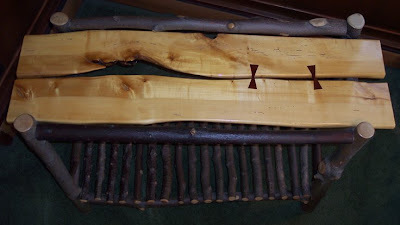 When I first started woodworking, I built rustic furniture. The wood was free (fallen limbs in the neighborhood), it required few tools, and it involved basic joinery. From there, I became interested in building New Mexican furniture because the carving looked like fun. Then, I migrated toward Mission furniture, then Shaker furniture, then learning how to handcut dovetails, then how to make handplanes, and now PA German furniture. I’m crazy-interested in learning more handtool techniques. Recently, I bought a video on marquetry from Jane Burke and a video on sharpening handsaws from Tom Law. A year ago I learned how to make string inlay, for a line and berry design, from Steve Latta. There are a multitude of other types of woodworking and ww techniques, including wood bending, veneering, carving in the round, chip carving, furniture design, making handtools, mastering complex joinery, finishing, building musical instruments, and woodturning, just to name a few. And my list of “to-build” projects. Well...I will never reach the bottom of the list. But that’s what I love about woodworking. It’s impossible to learn everything or build everything you'd like to, so it's constantly exciting and it's impossible to be bored.